Chaotic Crafting: So many NEW things going on in our household! Isn't he just the sweetest little guy?! This is not the only thing I have been busy with (though it seems like it most of the time!). I have also been designing some new patterns. Here is a bracelet I recently whipped up! This is a pattern of my own design. I have been on a pattern designing kick lately. Here is the back view...I LOVE this button! So glad I was finally able to find a good use for it. Here is a picture of the bracelet laid out flat. I have a small wrist, so this pattern is for a 6" wrist. To make the bracelet larger, simply add more SC to the button end of the bracelet. 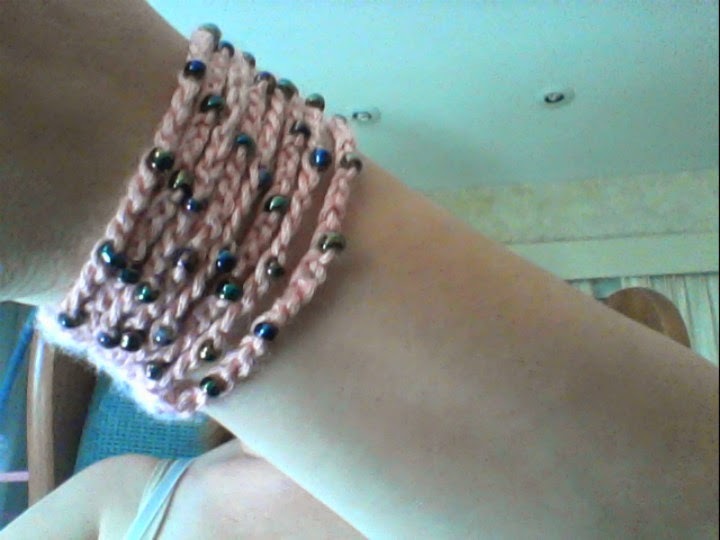 This bracelet is made using size 3 yarn, an E hook, approx. 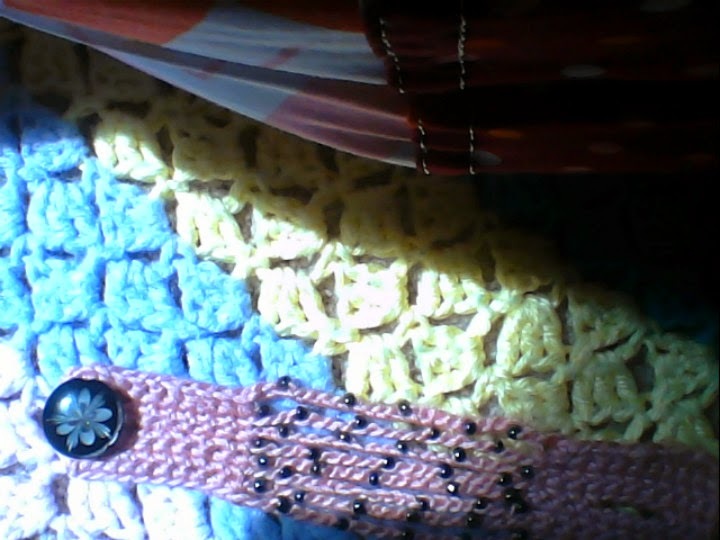 1" button, and 40 beads. in 5 of your beads, 10 FSC, chain one, turn. Row Two: SC into first 10 FSC, chain 20 while randomly adding in 5 of your beads, SC into last 10 FSC, chain one, turn. Rows Three-four: *SC into the first 10 SC of previous row (10 SC), chain 20 while randomly adding in 5 of your beads, SC into last 10 SC of previous row, chain one, turn. * Repeat. Row Five: SC into the first 3 SC of row 4, chain 4, skip 4 SC and SC into last 3 SC (10 SC), chain 20 while randomly adding in 5 of your beads, SC into last 10 SC of row 4, chain one, turn. Row Six: SC into first 3 SC of row 5, One SC into each of the 4 chain spaces, SC into last 3 SC, chain 20 while randomly adding in 5 of your beads, SC into last 10 SC, chain one, turn. Row Eight: SC into each SC of previous row, chain 2 while randomly adding in the last 5 of your beads, SC into each SC of the previous row. Tie off. Sew in ends. 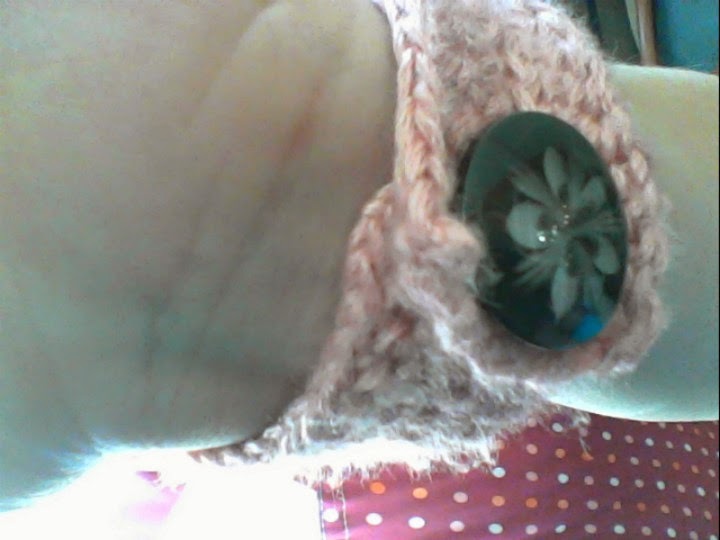 Finish: Sew button onto non-button-hole end of bracelet. Enjoy! 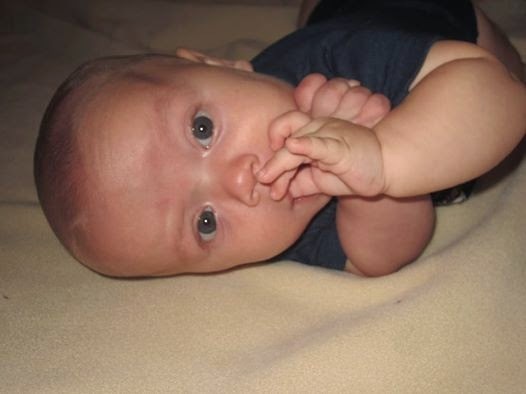 beautiful baby boy and bracelet. thank you for sharing!